Socomore Cable Cleaning products provide high performance power industry electrical and cable cleaning solutions and are preferred by the electrical utilities and their cable and switchgear contractors. Socomore PF power cable cleaning wipes and solvents provide residue free cleaning ensuring no earth tracking or local hot spots. Electrical cleaning solvents are approved for EHV Extra High Voltage use up to 440kV with full resin adhesion to cable joint surfaces eliminating moisture ingress. PT Technologies PF cable cleaning wipes approved and used by - ABB, Balfour Beatty, BICC, Boston Edison, Doble Engineering, EDF (UK), e-on, ESB, General Electric, Georgia Power, Florida Power, London Electricity, Northern Electric, Pacific Gas & Electric, Plymouth Bishop, Prysmian, Scottish Power, Tyco, United Utilities, Elastimold. 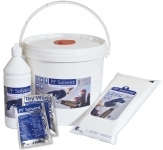 Health & Safety : PF Solvents and cable wipes are designed to replace traditional fast evaporating cleaning solvents such as trichlorothane. 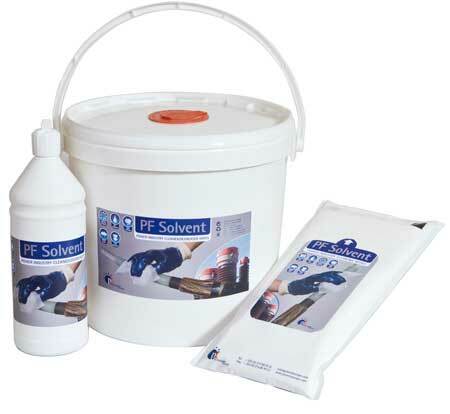 PF solvents and cable wipes are classed as combustible liquid, this eliminates the risk of flash-fires and logistics and storage issues associated with flammable products. 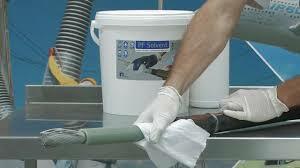 PF solvent is not classified as hazardous goods.